Hi friends! 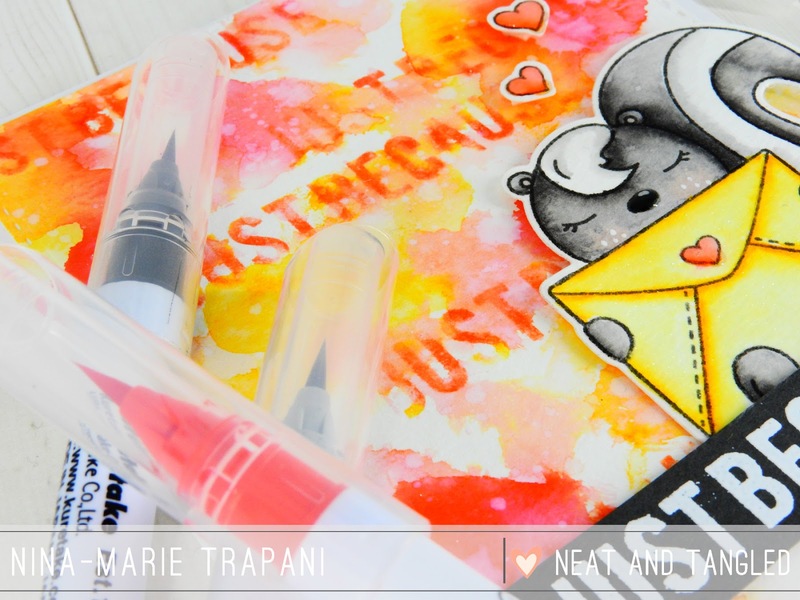 It's Nina-Marie here with you today sharing some inspiration using a couple of Neat & Tangled's newest stamp sets! Today I have used both the Celebrate and Little Stinker stamp sets. I love the sweet skunk image from Little Stinker and thought it would be dun to pair up with the big, bold greetings from the Celebrate stamp set. I wanted to also use the words from Celebrate to add texture to the watercolor I have behind the skunk. 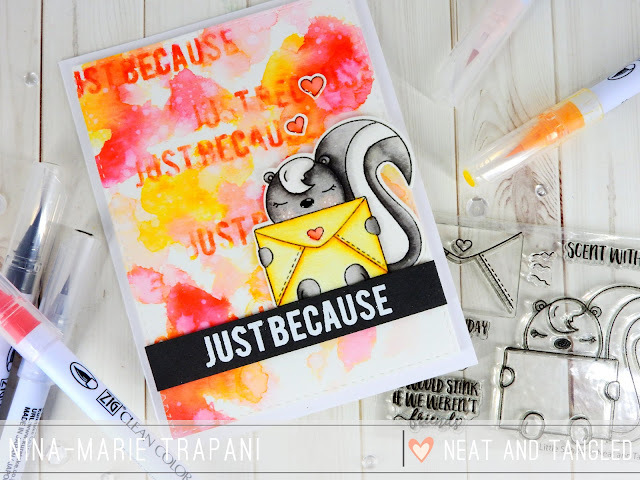 To do this, I used my Zig Clean Color markers to "ink" my sentiment stamp (which says "just because"); I applied the color from the markers onto the face of the stamp and then spritzed the ink-covered stamp with a light amount of water to get the color moving. 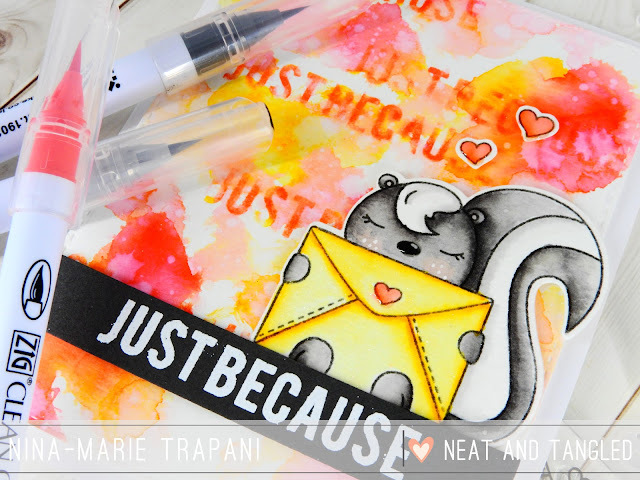 I stamped the sentiment onto the watercolor paper and repeated the ink-applying process multiple times until I had a few "just because" sentiments on the background. 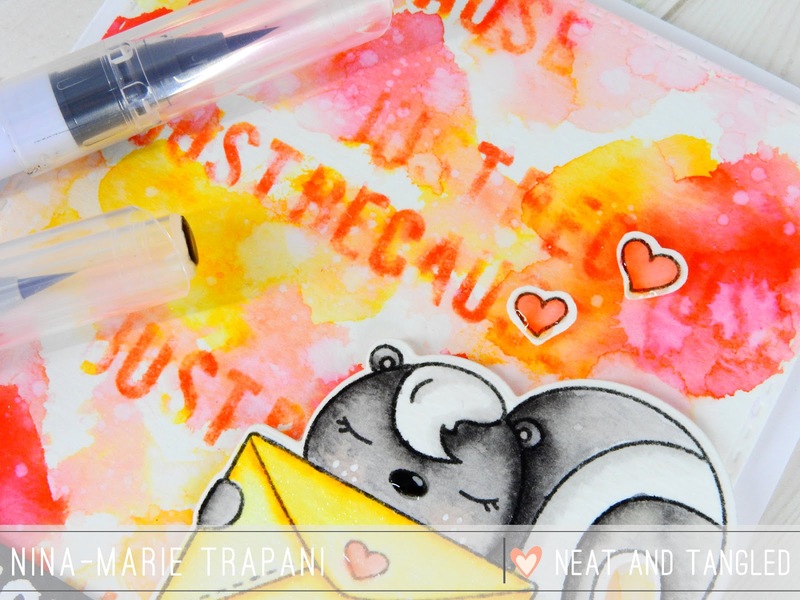 I then watercolored over the words with the same two markers I used for the stamping. I applied the color this time by scribbling areas of color onto the paper and then blending everything out with my water and brush. I also colored in the skunk with Zig markers and die cut it out with the coordinating Little Stinker dies. I love how bright and bold the colors are on this card. 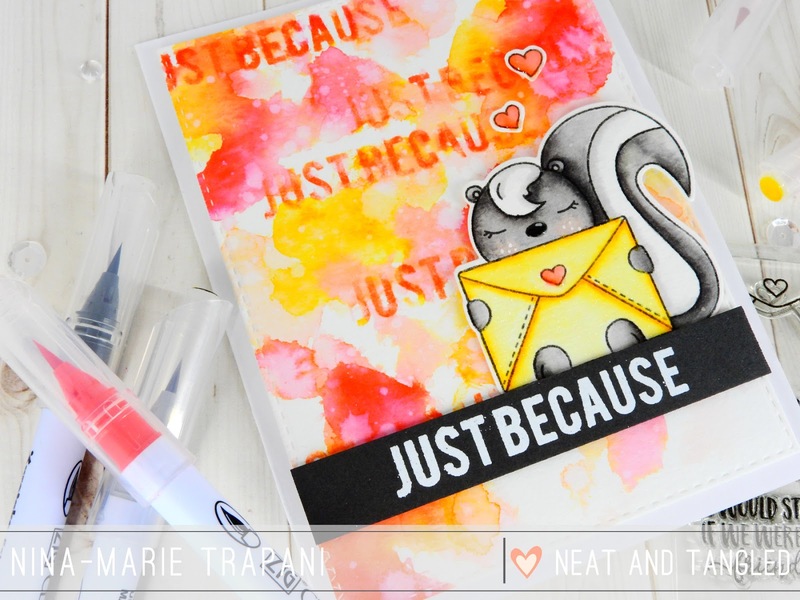 The colors allow the dark colored skunk and strong sentiment to pop and stand out beautifully! I also really love how the texture of stamping the text into the background of the watercolor really adds some great interest to the overall design. I hope this has inspired you to try not only stamping with Zig Markers, but also gave you ideas for using the Little Stinker and Celebrate stamp sets from Neat & Tangled! Thanks so much for stopping by and spending your Thursday with me... I'll see you again very soon! A pretty card Nina, lots of great colour and yet another great way to use the Zigs. Love that Little Stinker set too! Beautiful card, love the background. An exclusive set for STAMPtember!